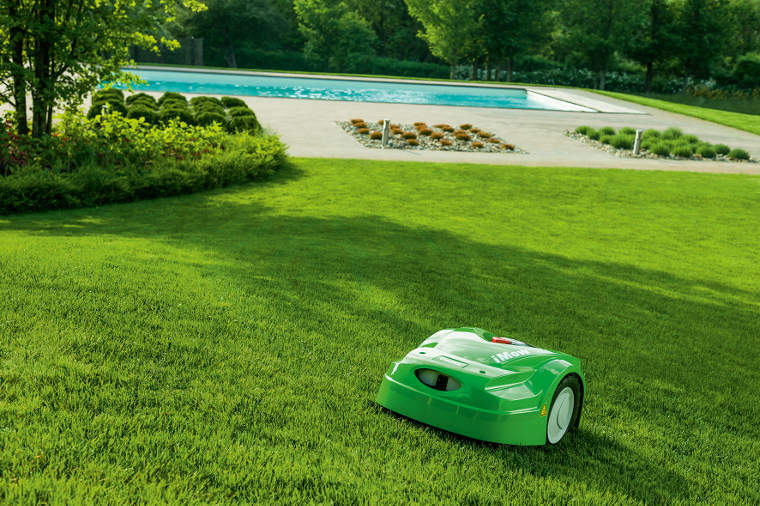 We’re often asked, “Are robotic lawn mowers any good?”. Robotic lawn mowers have become more and more popular over the past 10 years and they’re becoming more advanced. The question of whether they are any good comes down to what results you’re after. If you want a “well-manicured”, clean, green look, then how a lawn mower’s blades cut of the grass matters. You will want a machine which doesn’t fray or tear the blades of grass (which can cause browning and drying), so in this case, we would still recommend one of our range of push lawn mowers in Cork. Push and ride-on lawn mowers have more powerful engines and higher RPM. This cuts the grass cleanly, which tends to keep it green and soft. Manual mowers also allow you to give your lawn that clean ‘striped’ appearance. A robotic lawn mower like the iMow cuts in a random pattern. But if you want an almost entirely automated management of your lawn, which never overgrows, we recommend a robotic lawnmower. Here’s a breakdown. We stock Stihl’s iMow lawnmowers, and the higher range model, the Stihl iMow 632 PC can cut an area of grass up to 4,000 square metres. You can remove the keypad so it’s easy to program (you don’t have to be crouched down to set it up). We currently have this model on sale. The iMow RMI 422 P is the smaller model than the 632. It can cover up to 1,000 square metres — perfect for most homes. All Stihl iMowers run off Lithium-Ion batteries and are completely self-sufficient once they’re installed. This means that, theoretically, once they’re set up and properly programmed you shouldn’t have to touch them again. They have a timer scheduling system that’s very similar to that of a water sprinkler, so you can choose the days and times you want it to start cutting your grass. The iMow knows its own battery life and will automatically return to its charging dock without your help. Once recharged, it can resume cutting if needs be. One of the chief concerns with robotic lawn mowers is their safety. Are they safe to run unsupervised? The simple answer is yes. The iMow has built-in safety sensors. If it hits an obstruction like a rock, football, or tree or something left in the garden, the lawn mower will bump into it and then turn away in the opposite direction. If someone tries to reach under, sensors will instantly stop the blades, and then the iMow will turn around 180 degrees and move 10 feet away before re-activating the blade. The blade is deep inside the unit and is surrounded by a safety skirt so that the sensors can detect danger long before anything is at risk of ever touching the blades. To increase safety, rather than the blade itself being height-adjustable, the entire unit raises or lowers closer to the ground. The eight adjustable heights (from 1-8) are adjusted by simply turning a knob on the panel. This raises or lowers the entire deck rather than the blade. You can also set it up to go to up to 4 different zones, and have it go to some zones more often than others. If you see one area needs more attention than another, you can change the plan so that it spends more time in that area than other areas. This ensures that your lawn can look good all of the time. The iMow is the only robotic lawn mower that uses a standard lawnmower blade. Both sides of the blade are sharp, and to increase the lifetime of the blade, every time the iMow hits an obstruction it stops, then automatically reverses the direction of the blade until it hits another obstruction. This means that over time, wear and tear is evened out and the blade lasts twice as long. So, is a robotic lawn mower any good? It’s a question of the results you’re after. It depends on what you are personally after. If you want a well-maintained garden with no work on your part, we recommend the iMow hands down. If you want lush, green grass, you may prefer a regular lawn mower. I hope this answers some of your questions. If you have any other queries don’t hesitate to check out our range, or call us on 021-4965132. Note: This post is for those who just want a few tips and tricks for keeping their lawnmower well maintained. If you have any serious issues and the below steps do not work, we’d recommend you give us a call or drop your mower into us here at Douglas Forest & Garden. We have a dedicated in-house service for lawnmower repair. Not to be pedantic, but it’s always worth glancing over the manual that comes with your mower. Every lawnmower is different and some of them have their own quirks, so the first step before tinkering is always to check the manual to ensure you’re doing the right thing for your make and model. If it’s the start of the summer and you have a bit of petrol from last year, drain it. Believe it or not, petrol spoils after a few months. It’s a common reason for lawnmowers to have issues. Before you spend twenty minutes straining yourself pulling the chord, drain the lawnmower and replace it with fresh petrol. If it’s very dark or contains floating debris, drain the oil and replace it with the appropriate oil. In most models, to change the oil you need to remove a drain plug beneath the lawnmower. Make sure that you drain it completely. If the lawnmower doesn’t have a drain plug, check your manual to be sure, but in most cases, you need to tilt the mower on its side and drain it through the ‘fill hole’. With our wet Irish weather, grass can quickly cake into the undercarriage. The caked grass blocks the blade and clogs the discharge chute. You will need to turn the mower on its side to access the undercarriage. Before doing this it’s often best to ensure the petrol tank is empty as this can leak. As a safety precaution, always ensure the lawnmower is completely switched off, and remove or disconnect the spark plug before working. Use a wire brush to scrape grass clippings and dirt from the undercarriage and spray the remaining debris away with a hose. Sparkplugs are inexpensive and easy to replace. If your lawnmower isn’t starting after a few tries and you have tried the above steps first, it might be time to change your sparkplug. In most models, to do this you unhook the sparkplug wire and take out the old plug with a socket or monkey wrench. Make sure not to overtighten the new sparkplug or the lawnmower won’t start. Branches, stones and other objects take their toll on a lawnmower’s blades, which become dull after a few uses. A dull blade tears grass rather than cutting it cleanly. You can sharpen the blades with a vice and metal file but we do not recommend this for the inexperienced. If all else fails, getting a professional lawnmower service ensures that it’s in top working order for the summer. Our lawnmower service will do all of the above steps, plus check and service the lawnmower’s air filter, engine, and examine for faults. If you are looking for a new lawnmower we recommend you check out our site as we often run a lawnmower sale. Any questions? Please give us a call on 021-4965132. If you are seeking lawnmower sales in Cork, Douglas Forest & Garden can help. We offer 100% secure online booking and you can then stop by and collect your purchase. 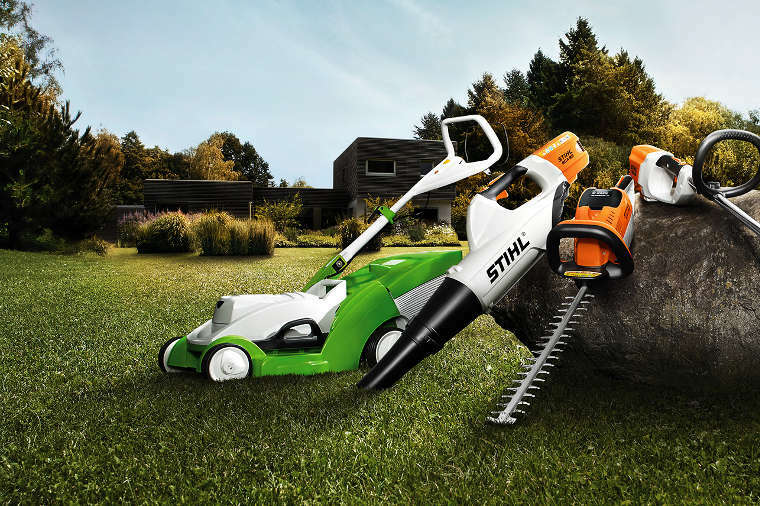 We currently have great sales on Stihl Lawnmowers. Stihl is our preferred brand due to its durability and price. Here is an overview of just some of the lawnmowers we currently have on offer, starting on the higher end which also offers a greater discount. As sales can expire or change, please be sure to view more of our Lawnmower sales. Stihl developed the RM 756 YC as one of their flagship models. They developed it for tough, long-lasting use by professionals. It has a 54cm/21″ cutting width and a variable hydrostatic drive, which is designed to mow areas of up to three thousand square metres. It has a sturdy ‘hybrid’ housing which is, like all Stihl models, quite durable. The fold-up handlebars are adaptable to body height and the RM 756 also has an anti-vibration system so that you can mow away the entire working day. 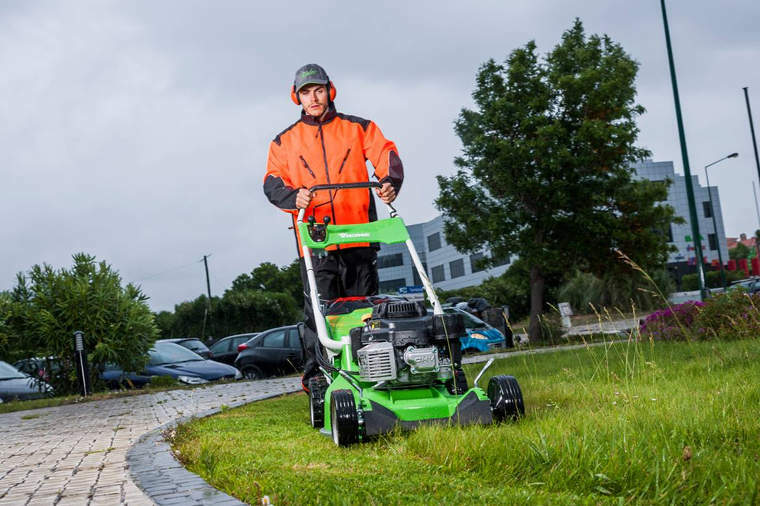 The RM 448 has a cutting width of 46cm/18″, making it best-suited for lawns of up to 1200m² in size. It is housed in a light polymer and has a powerful OHV engine. It has a variable speed adjustment and an easy start system to get the job done quickly and efficiently. You can also adjust the deck height, with six different settings, and it’s all done using one operating lever making it nice and easy. You can view this mower here. The STIHL RM 248 best suits medium sized lawns up to 1200m². You can easily move this one around the garden, even if there’s a bit of a slope. It also has a large 55-litre grass catcher box. You can also adjust its height with seven different settings, allowing heights ranging from 25cm to 75cm. With the STIHL RM 650 V petrol lawn mower, you can mow your lawn efficiently and with ease and also make good use of the grass for fertiliser. It has a cutting width of 48cm/19″, making it ideal for large lawns. You can also use it as a practical mulching mower without having to change the blade. Simply fit the supplied mulching plug and you’re good to go. When you use it in mulching mode, it finely shreds the grass clippings and evenly distributes them directly onto the lawn, acting as a natural fertiliser. The RM 650’s “Vario” drive system allows you to easily control your moving speed so you can easily adapt to slopes and different lawn conditions. You can control the mowing speed without changes affecting the engine/blade speed of the Kohler engine. The RM 650 also has a 7 setting height adjustment, and a fold-open 70-litre grass catcher box. If you are looking to buy a ride on lawn mower, Cork’s Douglas Forest and Garden have the best quality tractor mowers available. This includes Stihl and Club Cadet Tractors. We also service and repair lawn mowers, which is why we stand by these manufacturers for their efficiency and reliability. We also stock ride on lawn mower accessories including sprayers, sweepers and trailers, so that you can get the most out of your tractor. While we are based in Cork, all of our ride on lawn mowers come with free delivery to anywhere in Ireland. Visit us online now to view our full range of tractor mowers. Anyone with a sizable garden knows the pain of managing a lawn with a regular push lawn mower. Here are a few pointers to help you evaluate if a ride on lawn mower is best suited to you. Evaluate the length and width of your garden. One acre is equal to roughly 4,046 square metres. Multiply the length of your garden by the width in metres and divide your total by 4,046 to determine the size of your garden in acres. A medium-small garden is one which is under half an acre in size. A ride on lawn mower is best suited to a larger space, which is anything over half an acre. 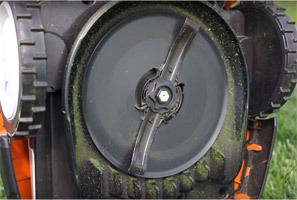 Ride on lawn mowers are pricier and require maintenance, including blade sharpening. This is something we cover at Douglas Forest and Garden. Check the cutting width of each model. A larger cutting width will mean fewer passes to finish the job. Search YouTube for amateur reviews of the model you are interested in. You can often find helpful tips and suggestions. Here is an example. Follow this link to view our full range of ride on lawn mowers. If you have any questions about any of our models or our free delivery service, please contact us on 021 4965132 We also provide lawn mower repairs and servicing. Every inch of grass is a canvas, you can create beauty with a Cub Cadet tractor mower to your home garden grass. Cub Cadet tractors set a high standard of mowing performance. They are designed to give you an unmatched strength and durability. These mowers combine fantastic cutting, collecting and mulching along with responsive handling. With incredible comfort, innovative technology and versatility, you can rely on these mowers to make the most of your grass. We have different types and models in store, here is our full range of Cub Cadet tractor mowers. Cub Cadet direct collect tractors transport grass clippings into a grass catcher box in the easiest way possible. All direct collect tractor models feature a durable grass catcher bag. These mowers are the perfect option for people who have a large area of grass and require a lawn tractor with great power, endurance and cutting performance as well as easy collection. An integrated handle is located on the box to make removing and emptying the grass box fast and easy from the driver’s seat. Here are all our direct collect tractor models. 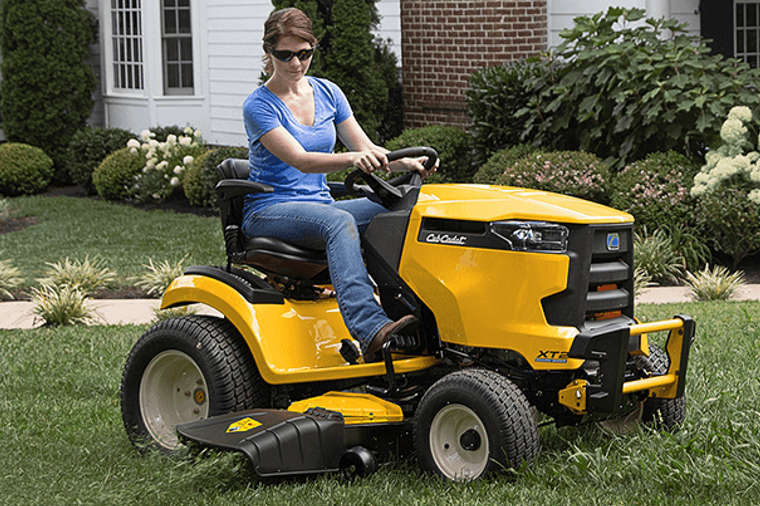 Cub Cadet Side discharge tractors are perfect for homeowners with gardens that have a variety of grass conditions or require a higher work rate than a rear collecting tractor mower. When discharging the clippings from the grass, they are released through an opening on the side of the cutting deck and spread back onto the grass. The clippings will act as natural fertilizer giving you a more healthy and beautiful looking area of grass. Here are all our side discharge tractor models. Cub Cadet zero-turn steering tractors are perfect for reducing the amount of time spent mowing. The bigger your lawn and the more turns required to mow it, the more of a reason to have this type of mower. Zero-turn mowers come equipped with 360° turning technology that lets you easily cut around obstacles with confidence. These mowers feature four-wheel steering with steering wheel control giving you increased stability and a faster cutting time. These tractors offer incredible efficiency, great comfort and fantastic durability. Here are all our zero-turn steering tractor models. With a Cub Cadet tractor mower, you will experience enjoyable mowing with an impressively beautiful cut. Order your Cub Cadet tractor mower from Douglas Forest & Garden today. You can visit us in-store, or call us on 021-496-5132. Gone are the days of walking endlessly up and down pushing a lawnmower. Thanks to the iMow, you can sit back and relax while it cuts the lawn for you. Buying the iMow is easy but what can be hard is installing it. The installation process is the most important aspect in relation to achieving the best cutting results possible. Don’t worry we are here to help you by taking you through the necessary steps to install the Viking iMow. Here is everything you need to install your docking station, perimeter wire and iMow to perfection. Before you do anything, simply make sure your lawn is clean, tidy and free of any toys, objects and debris like twigs and leaves. Make sure your grass is cut to an acceptable length which tends to be a length no longer than 10mm. When these minor details have been checked off the checklist, you can proceed to the more important parts of the process. You will need to plan the layout for your perimeter wire, the best course to take through your lawn. Create islands around obstacles you want to stay clear of. You also need to plan and determine the best position for your iMows charging station. Ideally somewhere flat and in a middle ground which can be accessed from all angles. Stay away from sprinklers and near to a power outlet. Lay your perimeter wire at a reasonable distance from the edge of where you want to cut. The perimeter wire must be laid flat. Then place your iMow in the charging station to start charging our iMow so it builds up a charge. Set your settings on the machine to your preference like the cutting height and time settings, these can be changed whenever you want using the control panel. Do not cut any corners to save time as this will only result in your lawn suffering. It is worthwhile checking your installation after you are confident it is completed. Take a step back, have a walk around your perimeter wire and make sure your settings are set to your liking and appropriate to how you want the lawn cut. Make any necessary adjustments before beginning to use the iMow mower. Once you have done all the above steps, you are good to go. It is now time to let your robotic mower go to work and do the hard work for you while you sit back and relax. If you are experiencing any problems with your iMow make sure to contact your Viking dealer for further assistance on the issue. To learn more about our full range of Viking iMow, call us on 021-496-5132 or visit us online today. Stihl battery-powered lawn mowers are innovative and powerful machines with full freedom of motion. Stihl cordless lawnmowers offer people the support they need to maintain their garden. They effortlessly mow lawns, borders and around plants. They provide great comfort for users as they do not feature a cable allowing users to move freely throughout the garden not restricting their movement. They have an efficient motor with an automatic blade speed adjustment which ensures long lasting battery performance and an excellent cut every time. 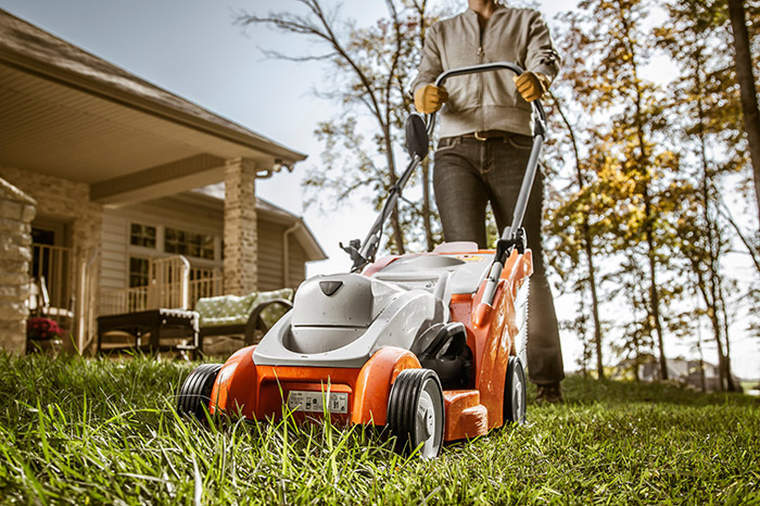 The high-performance Stihl battery-powered lawn mowers all have different cutting height adjustments. Their comfortable ergonomic mono handlebars allow for compact storage and user convenience as well as being easy to transport thanks to their lightweight and compact shape. Their batteries also fit other machines i.e Stihl hedge trimmers, brush cutters and more. Here is our full range of battery powered lawnmowers. The Stihl RMA 443 lawnmower is a high quality and mobile garden machine. It has high-quality lithium-ion batteries as well as high energy reserves. The motor has an activatable eco mode and a flow optimised blade which makes this lawnmower energy-saving in operation. The RMA 443 has a foldable grass catcher box which can hold 55l of grass clippings and is simple to empty. This lawnmower is easy to manoeuvre, lightweight and can be quickly and space-savingly stored or transported because of its QuickFix quick-clamping device. It has a cutting width of 41cm, a cutting height of between 25-75mm and is perfect for lawns up to 400m² in size. The Stihl RMA 443 C lawnmower is a high standard machine that won’t disappoint in making your garden beautiful. 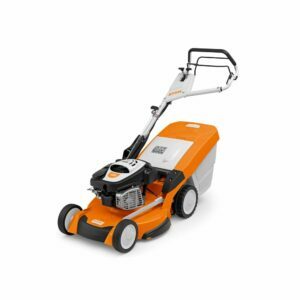 It is fitted with a powerful Stihl PRO battery system making it perfect for medium-sized lawns. This mower has an energy-saving eco mode which positively affects the machine’s operation time whilst mowing, collecting and mulching. Its flow-optimised blade consumes very little energy because the RMA 443 C produces minimal air resistance during every cut. It can be easily adjusted to the desired level in several stages with its central cutting height adjustment features. The mono-comfort handlebar ensures that the foldable grass catcher box which can collect 55l of clippings is easy to empty. This lawnmower has a cutting width of 41cm, a cutting height of between 25-75mm and is ideal for gardens areas up to 400m². The Stihl RMA448 TC lawnmower is perfect for dealing with large sized lawns. It offers great freedom since it is cordless. The lawn mowers working range is high in eco mode due to the automatic adapting of the motor power. This means the charge of the lithium-ion battery lasts even longer. There is constant propulsion by the 1-speed drive. The RMA448 TC can also be fitted with the mulching function. Its flow-optimised blade always makes cutting effective. Its mono-comfort handlebar and 55-litre capacity foldable clippings catcher box ensure easy emptying and comfortable handling. The lawnmower comes with six different blade settings so it is easy for users to cut grass with speed and precision. This lawnmower has a 46cm cutting width, a cutting height of between 25-75mm. Order your very own battery powered lawn mower online today or call us in store on 021-496-5132. A lawnmower is one of the most important landscaping machines for any homeowner. Having a lawn mower that is right for your home can make the job of upkeeping your garden so much easier. Choosing the right lawnmower in cork means thinking and knowing how to pick the right lawnmower before you make any decisions on purchasing one. Owning a great quality lawn mower that performs well and suits your grass and garden size is essential but it isn’t easy to find one especially if you are not well prepared prior to purchasing a new lawnmower. There are so many different types, brands, models and features of lawnmowers Cork available. Buying a lawnmower isn’t easy, there is a great deal to take into consideration. It can be overwhelming for buyers, however, asking yourself some important questions can make sure you get the right lawn mower for your needs. Do you want a powerful lawnmower to cut through long grass in a large area of grass? Where do you want to use your lawnmower? Do you want to use it to cut around plants and trees in your garden or do you want one to perform well on a tough garden surface? How strong and tall are you? How well do you want your grass to be cut to? Does it have to be stripped down like a golf green or are you happy once your grass is some way short? Is it your lawn flat or inclined? If you are looking to purchase a new lawnmower for your garden then contact us today on 021-496-5132 or visit us online. The days of walking up and down your lawn with a mower cutting the grass are gone. 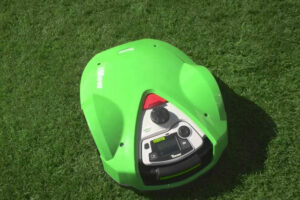 The Viking iMow is a robotic lawnmower that cuts the lawn for you so you can sit down and relax. The Viking iMow range ensures a perfect cut every time without having to lift a finger. It combines speed, reliability and efficiency all into phenomenal innovative technology. There are lots of different models so there is one for all sizes of lawns. Here is our full range of Viking robotic mowers. The Viking MI 422 iMow robotic lawn mower makes easy work of small to medium sized lawns. It is fully automated so once it is installed it will mow, charge and adapt its schedule all by itself. This mower has an efficient mulching blade which will make the lawn look lush and green without ever having to dispose of the grass clipping. It will mow grass areas of up to approx. 500 m². The Viking MI 422 P iMow robotic lawn mower is great for small to medium sized lawns. This mower is fully automated, once it is installed it will mow, charge and adapt all by itself. Its efficient mulching blade gives the lawn a green and luscious look. With this mower, you never have to dispose of any grass clippings. It has a powerful battery that can mow lawns up to 1,000 m² in size. The Viking MI 632 iMow robotic lawn mower has a dynamic mowing plan and intelligent charging system, it is fully automated. When this mower is installed, it will mow, charge and adapt its schedule by itself. Due to having an efficient mulching blade, the lawn will look lush and green after every cut. You never have to dispose of grass clippings with this robotic mower and it can handle lawns up to 3,000 m² within a short time. The Viking MI 632 P iMow has a battery capacity of 194 Wh. 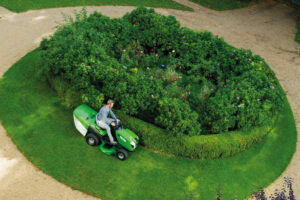 It manages its programme reliably and the robust mulching blade cares for a perfect lawn. Its mulching blade changes rotational direction, ensuring that the mower undergoes uniform wear and remains sharp. It easily takes care of lawn areas up to approx.. 4,000 m². The Viking MI 632 PC iMow robotic lawn mower has a battery capacity of 3.8 Ah and a mowing time of 150 minutes per battery charge. It can handle lawns up to approx. 4,000 m² in an active time of only 15 hours/week. The active time can be changed at any time using the app on your mobile device. To purchase a Viking robotic lawnmower call us today on 021-496-5132 or visit us online today. 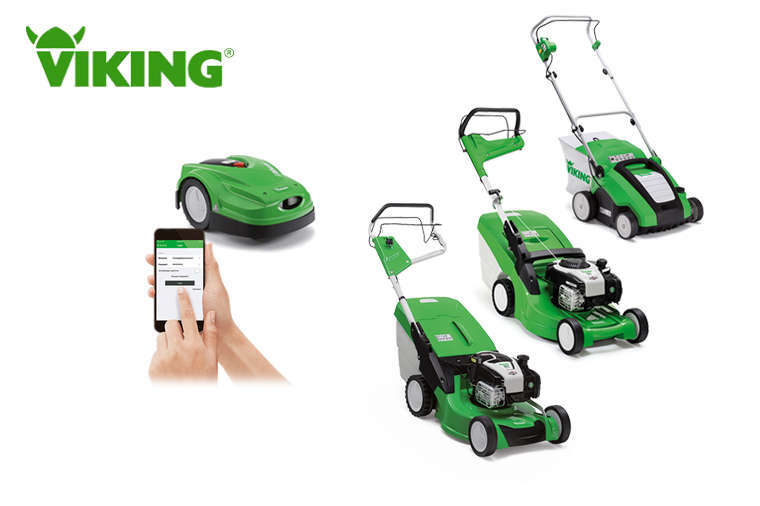 The Viking lawnmower range offers incredible lawnmowers that provide an effortless cut and a powerful, reliable performance. You are guaranteed to find the perfect lawn mower for your garden with one of our Viking lawnmowers. Different models have different features so there are lawnmowers to suit both commercial users and domestic users. All of our mowers for sale can be collected in our store in Frankfield, Co.Cork. Here is our full range of Viking lawnmowers. The Viking MB 248 18” petrol lawn mower has a 46cm cutting width which easily manages lawns of up to approx.1,200 m². The lawnmower cutting height can be set precisely with the central 7-setting adjustment. Its compact design allows it to access tight spots. The catcher box for the grass has a volume of 55 litres and can be emptied easily. The EVC 200 engine provides greater power and ensures low vibrations. The Viking MB 248 T 18” self-propelled mower is a compact petrol lawn mower which is ideal for small to medium lawns. With a large-volume grass catcher bag and single speed drive system, cutting and collecting is effortless. It features robust sheet steel housing and a handlebar which is foldable making it easy for transport and storage. The Viking MB 253 21” lawn mower has a cutting width of 51 cm and a 55-litre grass catcher box. It is suitable for medium-sized and large lawns of up to approx. 1,800 m². Its sturdy sheet steel housing ensures durability and the new powerful OHV engine provides high power and low weight. The Viking MB 253 T 21” self-propelled lawn mower has a cutting width of 51 cm and a 55-litre grass catcher box. It is suitable for medium-sized and large lawns of up to approx. 1,800 m². Sturdy sheet steel housing ensures durability and the new powerful OHV engine provides high power and low weight. The Viking MB 443 17” lawn mower has a 41 cm cutting width and lots of practical features making it easy to manoeuvre and use. The grass catcher box has a volume of 55 litres. Its cutting height can be easily changed by the spring-loaded control lever. This lawnmower has innovative engine technology and ergonomic features making it a real mowing pleasure. The Viking MB 448 TX 18”self-propelled lawn mower has a 46cm cutting width, makes quick work of mowing grass. Its grass catcher box has a volume of 55 litres. The cutting height can be changed by the spring-loaded control lever. The lawnmowers 1-speed drive makes lawn mowing easier. The Viking MB 448 VC 18”self-propelled petrol lawn mower has a 46cm cutting width, is perfect for small and medium-sized lawns of approximately 1,200 m². It has a high-tech housing, central cutting height adjustment and a 55-litre catcher box with a level indicator which is easy to empty. The Viking MB 448 TC 18”self-propelled lawn mower can cover 1,200 m² effortlessly. It has an OHV engine with an easy start system and a 1-speed drive system making it a high-performance lawn mower. The grass catcher box has a large volume of 55 litres. The mono handlebar allows for comfortable operation. The Viking MB 545 VE 17” key start lawn mower is a great comfort starter. It has a top quality Instart system meaning it can be conveniently started by the push of a button. Its Vario drive ensures flexible speed control. It is capable of mowing lawns up to approximately 1,200 m². The Viking MB 650 T 20”self-propelled lawn mower is comfortable and durable on large lawns. It has a robust aluminium housing, the reliable Kohler engine with an easy-start system and the sealed ball bearing. The standard mono handlebar facilitates the removal of the 70-litre catcher box. The Viking MB 650 V 20”self-propelled lawn mower can be adapted to different speeds giving a great cutting and collecting performance. It has a powerful Kohler engine with easy start system which remains constant at all times. The lawnmower has a multi-blade installed as standard and a supplied mulch insert so it can quickly be converted into mulching mowers. The Viking MB 655 V 21”self-propelled lawn mower has a 53 cm cutting width. It can be changed to the desired speed without impairing its performance. It has a powerful Kohler engine with an easy-start system which remains constant. Its standard mono handlebar facilitates removal of the 70-litre catcher box. With the multi-blade and supplied mulch insert, it can be converted into a mulching mower quickly. The Viking MB 655 YS 21”self-propelled lawn mower tends to large lawns up to 2,500 m². It is maintenance-free, has a hydrostatic gearbox and a Kawasaki engine. This lawnmower has a high-quality and durable brake clutch which disengages the mowing deck with the engine running. The aluminium housing and impact protector ensure great value retention. The Viking MB 756 YC 22” hydrostatic drive lawn mower comes with a practical mono-comfort handlebar which makes emptying the catcher box simple. Its powerful hydrostatic drive and anti-vibration elements for fatigue-free working give an excellent performance. This lawnmower is suitable for mowing lawns of up to 3,000 m². The Viking MB 4 RTP 21” mulcher combines performance and robustness. It has a powerful Kohler engine, is low emission. Its axle bracket and bolts are reinforced, super soft grips provide for great ergonomic handle characteristics. This lawn mower has hard-wearing aluminium rims with rubber tyres, double sealed ball bearings, a gearbox and crankshaft. To purchase a Viking lawnmower call us on 021-496-5132 or visit us online today. We have a huge range of lawnmowers online and in store in Cork. We stock all the major brands of lawnmowers including Gardencare, Toro and Weibang. All of our lawnmowers are fully assembled by our trained technicians in store in Frankfield, Cork. They have their finishing touches applied and they are inspected, ready for in-store collection. We provide a range of high quality, reliable lawnmowers. We have mowers to suit your needs no matter how small or big. We sell stand behind mowers that are both push and self-propelled models suitable for gardens of all sizes. Here is our full range of lawnmowers for sale. The Gardencare LM56SP 22″ self-propelled lawnmower comes with a 22-inch strong steel cutting deck. 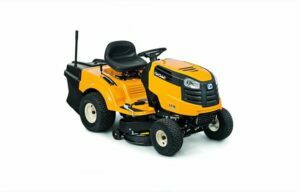 It features a powerful and reliable 190cc Briggs and Stratton 625 series engine, single lever height adjuster with 6 different settings from 25mm to 90mm and a large 70-litre grass collector. It has a 3 in 1 cutting system, affording the user the choice between collecting the grass, mulching or rear discharge. This lawnmower is suited for medium to large lawns. The Gardencare LMX53SPA 21″ self-propelled lawnmower has a 21″ cut width and a 163cc B&S 675EXi engine. It has a high-quality alloy deck making it more resistant to corrosion and dents so it is ideal for tough areas like coastal areas or highlands. It has a single lever height adjustment through 7 stages of cut height so finding your perfect cutting height is quick and easy. This lawnmower is built with a durable aluminium chassis. The Toro TimeMaster 30″ self-propelled lawn mower covers lots ground in little time. It has a sleek and lightweight body which easily circles around plants and trees. It has a 30” mowing deck so you handle large areas quickly and easily. This reduces cutting time by close to 40%. It has a dual-force cutting system and atomic blades which cut grass into a fine mulch. Its lever allows the handle to be placed upright for compact storage. A Briggs & Stratton engine is located inside the lawnmower, it has a cast aluminium frame and steel deck. This lawnmower delivers a high performance and is unmatched for durability. The Toro TurfMaster PRO 30″ self-propelled lawn mower covers more ground in a shorter time frame than smaller models. It is easy to operate and every component is perfect for use in rough conditions. This includes things like curbs, trailers to even multiple operators. It combines a great toughness with a quality cutting performance. This lawnmower has a highly productive 30″ deck helping you finish the job faster. Its conventional design is easier to handle compared to other lawnmower designs. It has a Kawasaki engine with a spin-on oil filter and dual element air filter which delivers the power for use. It also has a blade stop system so you can disengage the blades without shutting off the engine. 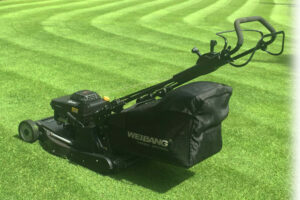 The Weibang WB537SCV 3in1 is a professional 22-inch steel deck lawnmower. It is powered by a Loncin 196cc engine. This lawnmower has a 3 in 1 parts system for mulching, collecting and side discharge by opening the side and inserting the side deflector. It also has a professional 3-speed shaft gearbox and single lever height adjuster. This robust lawnmower is great for any garden. The Weibang WB537SCV 3in1 is a top of the range high spec professional 22-inch steel deck lawnmower. It is powered by a Loncin 196cc engine. This lawnmower has a 3 in 1 parts system for mulching, collecting and side discharge by opening the cover in the side and inserting the side deflector. It also has a professional 3-speed shaft gearbox, single lever height adjuster and comes equipped with a blade brake clutch. Order your lawnmower online today or call us today on 021-496-5132. The VIKING iMow range enables you to achieve the perfect lawn with great ease. It provides a fully automatic lawn mowing experience tailored for your own garden. These lawnmowers are fast, easy to use and ensure a beautiful looking lawn every time. They shred grass clippings finely, which fall back onto the lawn and act as an effective fertiliser. This provides vital nourishment to help grow a healthy lawn and also there are no clippings to collect or dispose of making your job easier. When your grass is cut or the battery needs charging, it automatically returns to the docking station. 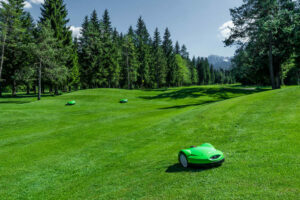 Once programmed, they will mow the lawn automatically, avoiding obstacles and mastering your lawn area. The days and hours of pushing a big bulky lawn mower around are gone with these incredible innovative mowers. Whether your lawn is 300m² or 4000m² there is an iMow perfect for you. We have a wide range of robotic lawn mowers in store, here is our fantastic range of Viking iMows. The MI 422 iMow is perfectly suited for small to medium sized lawns. It is fully automated, once it is installed it will mow, charge and adapt all by itself to suit your lawn. This robotic lawnmower has an efficient mulching blade making the lawn look beautiful without ever having to dispose of the clippings. It will mow lawns of up to approx. 500 m². It has 15 cutting settings and its dimensions are (L/W/H) 60cm x 43cm x 27cm. The MI 422 P iMow compact robotic lawn mower is also perfectly suited for small to medium sized lawns. It is fully automated and once the iMow MI 422 P is programmed, it will cut, charge and adapt accordingly all by itself so you w on’t have to do any work. Due to its efficient mulching blade, the lawn will look nice and green without ever having to dispose of the grass clippings. It is equipped with a powerful battery and can handle lawns up to 1,000 m². Its cutting width is 20cm and it weighs 9kg. The MI 632 iMow robotic mower is equipped with a dynamic mowing plan and intelligent charging system. It mows lawns up to 3,000 m² within a short time. It is fully automated so once the MI 632 is installed it will mow, charge and adapt all by itself. Its efficient mulching blade a green and luscious looking lawn without ever having to dispose of the grass clippings. It has 15 cutting height settings and its dimensions (L/W/H) 73cm x 54cm x 27cm. The MI 632 P iMow has a battery power of 194 Wh. It is suitable for lawn areas up to approx 4,000 m². It manages its programme reliably and the robust mulching blade cares for a perfect lawn. The blade changes its rotational direction automatically which ensures that it remains sharp. It weighs 13kg and has a cutting width of 28cm. The MI 632 PC iMow has a battery capacity of 3.8 Ah and a mowing time of 150 minutes per battery charge. It can handle lawns up to approx. 4,000 m² in an active time of only 15 hours/week. It has a cutting width of 28cm and weighs 14kg. The active time can be changed at any time using the app on your mobile device. 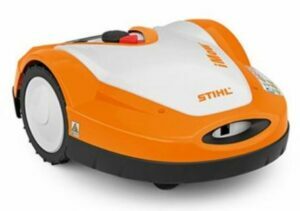 There are various models of the iMow robotic mower available. Each model is suitable for different needs with different features such as cost, battery life, lawn area and maximum lawn area. 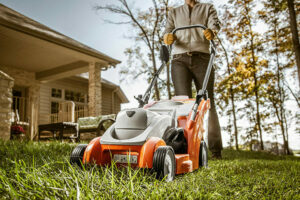 These features and needs will determine which mower is the right one for you. To learn more about the Viking iMow range, call us today on 021-496-5132 or visit us online today. If your garden has grass then it will need to be cut and landscaped regularly. To do this you will need a lawnmower. There are two main style lawnmowers you can get to cut your lawn;- walk-behind lawn mowers and a ride on lawnmowers. Walk-behind mowers are suitable for small residential lawns and gardens whereas ride on mowers are much larger and are suitable for larger gardens and lawns. Each mower has different features and some key differences. Buying a lawn mower is not a small purchase, it is going to set you back a significant amount of money so it is important to make the right choice. The mower you choose should depend on the size of your garden, the amount of money you want to spend and how much energy you want to exert. If you are unsure whether you need a ride-on mower or a walk-behind lawnmower, don’t worry we are here to help. Here are 2 main differences between walk-behind and ride on lawnmowers. The area size of grass that needs cutting must be considered when buying a lawnmower. Very small lawns are suited to walk-behind mowers whereas large lawns are suited to ride on mowers. A mower that is too small for the size your garden lawn will be working harder than it should and is capable of resulting in parts wearing out more quickly and requiring more frequent servicing. Trying to use them for long periods of time can harm the engine Push lawn mowers cut small and tough to get spaces whereas ride on lawnmowers cannot as they are such big bulky machines. Ride on mowers cut your grass at a fraction of the time of a push lawnmower so if you are short on time they are not ideal. Price is a huge difference when it comes to comparing walk-behind lawnmowers and ride on lawnmowers. Walk-behind lawn mowers are much smaller than ride on mowers, therefore, are cheaper in price because they have fewer parts and are smaller in size to manufacture. Ride on lawnmowers cut more grass at the end of the day than walk-behind mowers which is another factor of price. Another lawnmower cost factor is fuel consumption. Walk-behind lawn mowers require less fuel than a riding lawn mower making them the more affordable option. Price does not get the garden mowed. You need to evaluate the amount of grass you will need cutting on a regular basis. This will be an important factor as to which lawnmower you will choose to buy regardless of price. Lawnmowers are one of the most important landscaping tools all homeowners should have. When deciding on buying the best mower for you and garden consider all the differences, pros and cons with both the ride on and walk-behind mowers. If you would like to learn more about the different types of lawnmowers call us today on 021-496-5132 or visit us online now to view our range.